Older adults often have trouble self-administering eye drops and medications. It is difficult for them to tilt their heads, keep their eyelids open, and accurately dispense the liquid. The team set out to design an eye drop device that makes it easier for users to physically squeeze fluid out of the bottle, reduces the required head tilt, eliminates the need to squeeze with fine motor control, and increases the accuracy of the drop location so users experience fewer failed attempts where the droplet misses the eye. Anhidrosis is the inability to sweat normally, either across the entire body or only certain areas. Without proper perspiration, a person is at high risk of heat exhaustion or stroke, which can lead to hallucinations, comas, and death if left unaddressed. Though anhidrosis has many causes, it is a known symptom of a number of physical and mental disabilities, such as Multiple Sclerosis and Guillain Barre syndrome. While there are vests and bands that prevent overheating due to hot environments or physical activity, these products are not suited for the specific needs of individuals with disabilities. They tend to require self awareness of body temperature from the user, assume normal mobility, and overlook the heightened senses of touch and feel of certain people with disabilities. 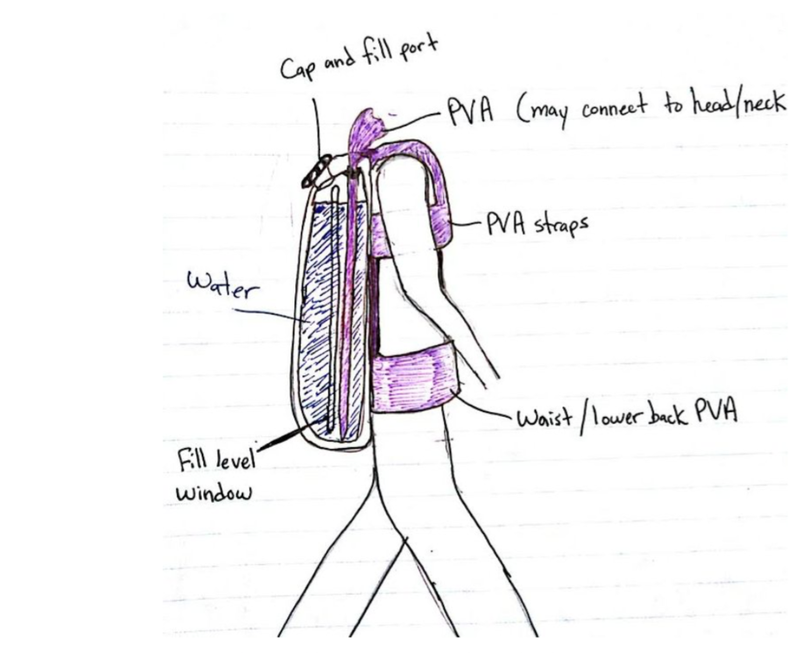 The team developed a battery powered backpack that pumps water to an absorbent fabric distributed across all of the backpack surfaces that touch the wearer. When the water wets the fabric, it cools the wearer using the same principle as sweat—evaporative cooling. The tubing runs from the water bladder in the backpack into the absorbent fabric, which runs down the back of the backpack and around the main and front straps of the backpack. The tubing that is sewn into the fabric has small perforations in it to evenly dispense water as it is pumped through. It is also surrounded by PVA to catch any excess water and ensure that the water does not drip off of the user and waste potential evaporative cooling. The water reservoir holds approximately two liters, which lasts approximately two hours at the current pump speed and keeps the backpack lightweight. A window in the backpack’s fabric allows the user to monitor how much water is left in the reservoir. A rechargeable battery powers the pump, and it is controlled by a flow rate switch. The initial prototype is complete and has been delivered to an end user for testing.